Interferons (IFNs) are key cytokines of the innate immune system known for their antiviral and immuno-modulatory properties. Three types of IFNs have been described: type I IFNs which are mainly comprised of IFN-αs and IFN-β, type II IFN or IFN-γ, and the most recently discovered type III IFNs or IFN-λs. Although IFN-α/β and IFN-λs share many overlapping functions, a unique role at the mucosal barrier sites has emerged for IFN-λs. In humans, the IFN-λ family consists of 4 proteins, IFN-λ1 (IL-29), IFN-λ2 (IL-28A), IFN-λ3 (IL-28B), and IFN-λ4. IFN-λ1-3 exhibit high amino acid sequence homologies, whereas IFN-λ4 is more divergent. In mice, only IFN-λ2 and IFN-λ3 are functional. IFN-λs are induced after viral infection by pattern recognition receptors (PRRs) that sense viral nucleic acids, including members of the Toll-like receptor (TLR) and RIG-I-like receptor (RLR) families. These PRRs signal through adaptor proteins such as MAVS to activate interferon regulatory factors (IRFs) and NF-κB leading to IFN-λ expression. In contrast, PRR-induction of type I IFNs is mainly IRF3-dependent. Many cell types can produce IFN-λs but the most potent producers are dendritic cells and epithelial cells (ECs) in barrier organs such as skin, lungs, liver and the gastro-intestinal (GI) tract. The preferential production of IFN-λs over IFN-α/β in ECs has been linked to the abundance of peroxisomes in these cells and the shift of MAVS from mitochondria to peroxisomes, promoting IRF1-induced expression of type III IFNs. IFN-λs bind to IL-28R, a heterodimeric receptor comprised of IL-10Rβ (shared by the IL-10 cytokine family) and IFNRL1 (or IL-28RA, specific for IFN-λs). In contrast to the broad expression of IL-10Rβ, IFNRL1 expression is restricted to ECs and immune cell subsets. Upon receptor binding, IFN-λs induce an antiviral response, very similar to the one triggered by IFN-α/β. 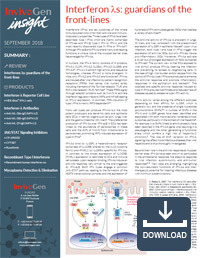 Both IFN types engage a common JAK–STAT pathway leading to the formation of the ISGF3 transcriptional complex and the expression of hundreds of IFN-stimulated genes (ISGs) that mediate a variety of activities. The antiviral activity of IFN-λs is prevalent in lungs, GI tract, and liver, consistent with the predominant expression of IL-28R in epithelial tissues. Upon virus infection, both type I and type III IFNs trigger the expression of antiviral ISGs, but only IFN-as induce pro-inflammatory ISGs. Moreover, IFN-λs activate a lower but prolonged expression of ISGs compared to IFN-αs. The current view is that ECs exposed to viral stimuli produce IFN-λs clearing the infection and preventing its spread to neighboring cells. 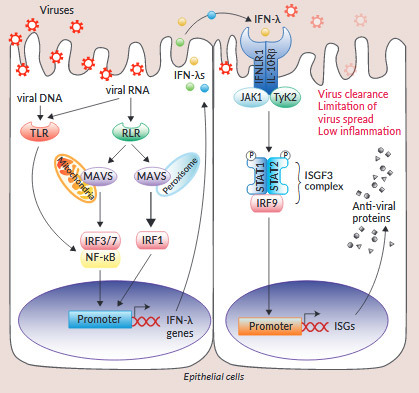 In the case of high viral burden and/or escape from the control of IFN-λs, type I IFNs are produced to enhance the antiviral response and promote inflammatory responses in the epithelium and beneath. The localized and specific antiviral response induced by type III IFNs ensures host fitness and reduced risks of diseases caused by excessive type I IFN activity. IFN-λ activity varies among the different subtypes depending on their affinity for IL-28R, which is generally low, and the presence of single nucleotide polymorphisms (SNPs). A number of SNPs in the IFN-λ and IL-28R genes have been identified and associated with both improved and worsened clinical outcomes, particularly in the context of viral hepatitis. For example, two SNPs linked to ethnic ancestry have been reported in the IFN-l4 gene: one resulting in a pseudogene and the other generating a functional allele which confers a high risk of hepatitis-C chronicity. The role of SNP variation on IFN-λ signaling may affect more infectious diseases than viral hepatitis and is thus thoroughly investigated. Beyond their role in the antiviral response at mucosal barrier sites, IFN-λs have been shown to participate in the antibacterial response, the adaptive response to viral infection, autoimmunity and anti-tumor responses. New data are emerging, highlighting the non-redundant functions of IFN-λs and their therapeutic potential for treating infectious diseases with minimum systemic toxicity.